What is the Story Conflict? 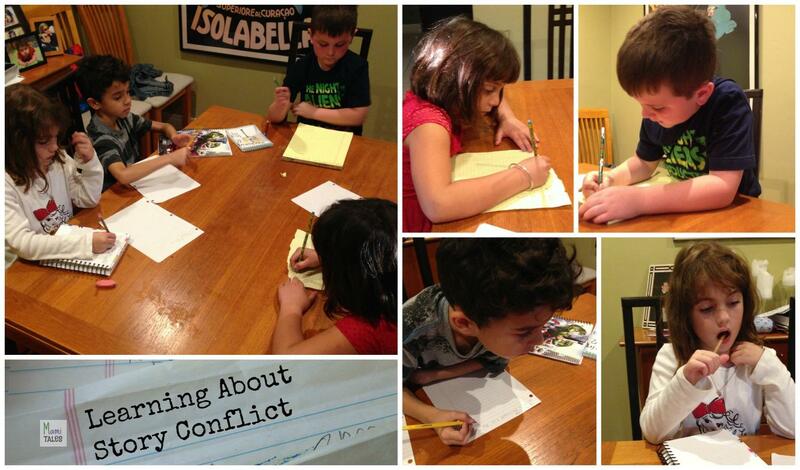 We had our second Movie Class yesterday, and my little filmmakers explored what makes stories move forward and be interesting: The Story Conflict. Last week we talked about the Importance of Story. I had asked the kids to think over the week, as their homework, what stories they wanted to shoot. I needed them to think what their story was about, which Characters they were going to use, where they wanted their stories to happen, and finally, how their stories were going to end. 3 of the kids did the homework, and we talked about their stories: Little Miss I wants to make a super Hero story called Green Girl, where the heroine and her husband help rid the town of littering villains. Mr. J wants to do a story about a bunch of kids at a playground who want to play. Mr. JS wants to do a story with the WordWorld characters that involves football. Some stories had a more clear conflict than others, and we talked about each of them to try and find who the protagonist was, as well as a simple problem they could try and solve to define a structure and an ending to their story. Talking about the playground idea, I asked Mr. J what the problem was. He said they couldn’t come to an agreement on what game to play. Just then he realized now he actually had a full story: a group of kids want to play, but they can’t agree on the game they should all play. Conflict. With Mr. JS, I asked who his main character was, or what his protagonist wanted. He said that Bear wanted his team to cheer for him — but the problem was that he only had 3 characters, which made it a team of one. Then I asked: What would happen if they all wanted to play football, but when they get to the field it is all muddied up? He then realized he now had a story — they had a conflict they had to solve. All these stories have clear character goals, and an ending where the story conflict gets solved. After reading we talked about the stories, and I asked them what the main problem of each story was. They could spot the conflict right away. I asked them to write a short story with the following conflict: two people (whoever you want them to be) are very thirsty walking in the desert. They finally find just one bottle of water. What do they do? Dog and Duck were looking for a bottle of water. They didn’t find any and they were very thirsty. They found a lake. They drank it together. They brought bottles. They were happy. A boy and a girl were very thirsty. A little drop of water was there. They didn’t know what to do. They tried and tried until they couldn’t do anything but look. So they looked for a bottle of water. They found one on their way home. So they drunk it on the way home. Once upon a time, there were two kids, boy and girl, who were so thirsty that lived in the desert. They finally found one bottle of water. So one drank half when they got home, and the other one drank the other half. After reading their stories I realized something: nowadays kids programing, and most of what they learn at this point at school and home, is to avoid conflict — or to try and solve it to prevent confrontations from happening. However, if there isn’t a strong conflict, or it is easily resolved, a story dies before it even starts. I will keep working with their stories — trying to show them how they can do the solving of the conflict but as a goal or the end of their story. In the meantime, I guess we’ll have to analyze programs they like to illustrate the point better in our next session! Tagged Inspiration for Kids, Movie Class. Have you heard of Kelso’s rules? It’s for conflict resolution. It sounds like that. Thank you for coming to the Inspire Me Monday Linky Party. No, I hadn’t. I have to check it out, thanks!